Next came signs in DC saying, “Why believe in God? Just be good for goodness sake.” They pictured a young person wearing a Santa outfit and looking like they belong in a Benetton commercial. This is good advertising. 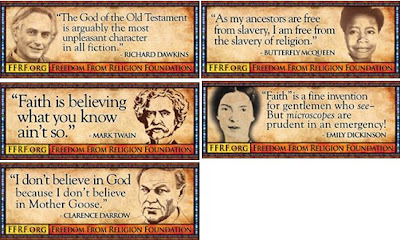 Recently the group Freedom from Religion Foundation paid to have these signs displayed on buses in Madison, Wisconsin. I think promoting Atheism is great. The London and DC sign campaigns were brilliant. With that said, these Madison posters are awful. There are so many things wrong with them, I can't type fast enough. First, they are all too negative. The sepia tone makes me feel like the Atheist movement belongs to the past like buggy whips, and baseball. What’s with Clarence Darrow? He looks like a Vulcan! And butterfly McQueen! Who in God’s name is Butterfly McQueen?